There’s no doubt that traditional braces are effective at straightening teeth; however, they’re not very patient friendly. Traditional metal braces are unattractive, and sometimes unbearable for adults. Invisalign invisible braces offer an alternative for adults who want to experience all the benefits of straight teeth. Dr. Hyde can evaluate your situation and determine if this procedure is right for you. Instead of brackets and wires, Invisalign utilizes clear, acrylic aligners to shift teeth gradually. Dr. Hyde will design your aligners in conjunction with an Invisalign laboratory, and you’ll receive the entire set at your next visit. Switch out the aligners every two weeks and visit us for periodic “progressive reports.” With Invisalign braces, you have the freedom to remove the aligners when you deem fit. For best results, remove them only to eat, brush, and floss. Most adults are candidates for Invisalign braces. The aligners are ideal for crowded or widely spaced teeth, and they can correct bite issues. Treatment times vary, depending on your case and how often you wear the aligners. Many patients achieve the desired goal in less than a year. Dr. Hyde and our team look forward to welcoming you to our dental family. Call us to speak with one of our friendly treatment coordinators and learn how we can give you a smile worth sharing. With the advent of state-of-the-art dental technology, you can now straighten your teeth for a gorgeous smile without having to undergo the hassle and discomfort of traditional metal braces. Worldwide, over 1,000,000 patients have straightened their teeth with Invisalign® clear aligners and the number continues to grow. The Invisalign® aligners are completely removable, so you can continue with a normal diet and lifestyle, they are also virtually invisible, so no one will even know when you have them. Invisalign® offers several benefits and advantages over traditional methods of straightening your teeth and correcting over- or under-bites. The first step in the Invisalign® process involves Dr. Hyde taking an impression of your teeth. This will ensure the most accurate, custom-designed fit possible for your aligners. 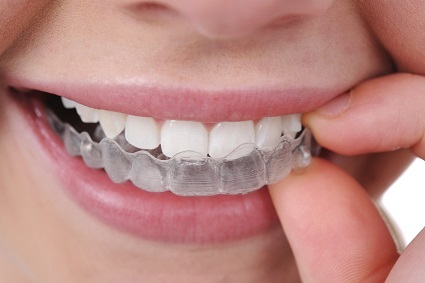 Once the aligners are made, you will receive a system of trays that you will use over a period of about 15 months. 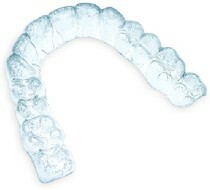 Every two weeks, you will change out the aligners you are wearing for the next set in the tray. Each set is designed a bit differently from the last, made for the progression of your teeth as they take a more straightened position over the time of treatment. The aligners should be worn with consistency throughout each day; however, they can be removed for eating and drinking, as well as cleaning your teeth and gums. In some cases Invisalign®, when combined with teeth whitening treatment, can achieve smile makeover-type results, at a fraction of the cost. Once you have undergone the Invisalign® treatment and it is complete, you will have a straight set of teeth resulting from a procedure that’s virtually invisible! However, to take your smile to the next level, Dr. Hyde can combine Invisalign® with other cosmetic dentistry procedures such as teeth whitening. This will leave you with a vibrant smile.